Carley Hill was asked to present its apprenticeship strategy on behalf of the National Apprenticeship Service and Federation of Small Businesses, to business owners and head teachers last week at University Campus Suffolk. 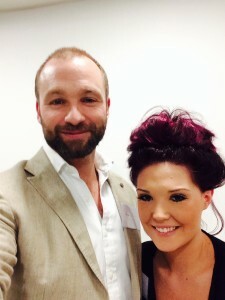 Salon owner Adam and lead apprentice Amy were the only speakers at an event designed to raise awareness of the opportunities for both businesses and students alike, held at the impressive Waterfront Building, UCS in Ipswich. It was a great opportunity to showcase the successes and growth that Carley Hill has experienced as a result of focusing on the development of young people in its business. All those in attendance were very impressed with Amy’s inspirational talk on the ‘Apprentice Experience’ and the exciting opportunities that have come from a real work place training. We are very proud of you- Well done Amy!